Hydropower is supposed to be "clean," as it doesn't rely on the burning of fossil fuels. But this form of renewable energy is controversial for several reasons. From displacing human settlements to inundating biodiverse landscapes, the construction of dams and hydropower facilities presents numerous environmental and social problems. Yet hydropower is a source of renewable energy - and if done with proper planning, can truly be green. Some 200 environmental activists are murdered every year, many from Latin American indigenous communities. One Chilean village is searching for the truth about the death of a young mother who protested a hydropower dam. Jordan goes to great lengths to get water to its people. It's a dry country that requires a lot of power and the water still doesn't always reach its destination. New technology could be the solution. 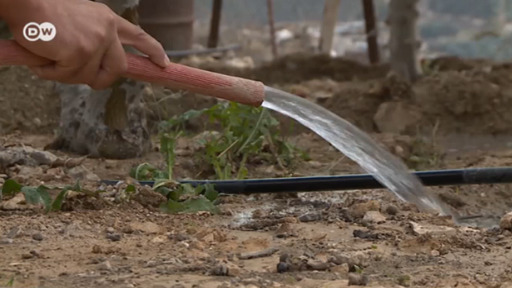 Jordan goes to great lengths to get water to its people. In the dry country that requires a lot of power and the water still doesn't always reach its destination. New technology could be the solution. At least 200 environmental activists were killed in 2016. That number rose in 2017, according to Global Witness. South American activists especially face threats for their work. In a small mountain village in Chile, the indigenous community is still searching for justice after tragedy struck. Why did tragedy strike an environmental activist couple in Chile? Who will win the fight over Germany’s coal phase-out and why is the movement attracting protesters from around the globe? Do beach cleanups actually help, or just soothe our conscience? We dig into these tricky subjects on this week’s episode of Living Planet. As investment in hydropower and construction projects ramp up, ecosystems and communities along Southeast Asia's longest river are paying the price. The Nile River has been the life line for East Africa for thousands of years. A mythical river, drinking water, irrigation, hydropower — the Nile feeds many needs in the countries it traverses. But now tensions increase over the water usage. Anna Osius and Linda Staude met people who depend on the river's water, from its southernmost source in Burundi down to the Nile delta in Egypt. For years, the Laotian government has been pushing to make the country a major provider of hydroelectric power. Critics say that dams are being built in disregard of potential environmental dangers. The Nile River has been the life line for East Africa for thousands of years. A mythical river, drinking water, irrigation, hydropower - the Nile feeds many needs in the countries it traverses. But now tensions increase over the water usage. Anna Osius and Linda Staude met people who depend on the river's water, from its southermost source in Burundi down to the Nile delta in Egypt. More than 100 cities worldwide get at least 70 percent of their electricity from renewable sources, according to a new initiative. How did they manage and what can we learn from them? Cities around the world are stepping up to reduce their carbon footprints. We look at some of the sustainable high-achievers. Water power is the largest renewable energy source in the world, but some plants are running out of water due to severe droughts. Is climate change jeopardizing the future of hydropower plants? Mongolia's miners consider the environmental cost of gold, Albania's hydropower plans threaten Europe's last large free-flowing river, and meet the pipeline protestor on a mission to save the planet.